Today the Doc On The Run podcast we’re talking about how a couple of days in a fracture walking boot can help you decide whether or not you can run a hundred miles. She knows as a lot about avoiding injury, about what to do when she gets injured during the race, when you get injured from overtraining. She knows a lot about this. She still have a lot of questions and I thought it would be useful to make a lesson that sort of talks about this. I think it’s really helpful to figure out what the thought process is when you get injured and you’re trying to actually decide if you can run a race because sometimes you have to make a decision about that. For example, if you’re going to do a race that’s in another state, in another town and you had booked a rental house for example online on Air BnB or something like that and you have to pay for it when you can usually cancel that reservation within a certain period of time but you can’t cancel that when you show up where you are supposed to show up. At that point it’s usually nonrefundable and that can be a lot of money. So you can’t always get the money back for the entry fee but you might go to change your flight. If you do it early enough you might be able to change your travel accommodations. Any of those things and she obviously want to get that money back if you’re not going to do the race. When you get injured, in fact most people who get injured seem to get injured somewhere around like four to eight weeks prior to their race. Why is that? First of that’s not complicated. You’re doing this progression, you’re like working your activity up. You get stronger and then you drop your activity down then you do it again and you drop back down. You do it again, you drop back down. Do it again and you drop back down. We all use this sort of increasing ramping up over and over and over the build our fitness without getting injured. The idea is we drop back down, allows you to recover and you can get stronger and stronger somewhere along the line. Something happens you tripped, you run the wrong surface, you do a little bit too much workout or something is really just off from one your days. You’re sick when you do a long run and you just have too much stress in your system even getting overtraining injury. That can happen to anybody. It doesn’t mean that you have broken it. It doesn’t mean you’re defective. It just mean you got injured and you have to deal with it. Well that does happen. So the problem is, is not you can’t heal it, it’s just are you going to heal in time. So if you’re a month out and you’re going to do one hundred mile trail race, think about what you’re doing. You’re kind of at your maximum build phase. You’re in the middle of this really long progression where you have to add a lot more mileage or intensity in terms of training and consequently stress. So if you get an injury like a tendon injury for example or stress fracture, it’s all kind of the same thing. They’re all stress, it’s just a different structure. One is a tendon, one is a bone but you have to figure out if you can do the race or not. We are having this this discussion and I was saying, look here’s what usually happens. Here’s what I hear from runners is they basically say okay I’ve got this injury a couple of weeks ago. It kind of hurt. It didn’t hurt that much. I did my next run and it hurt a little bit more and that kind of hurt the next day when I woke up so then I kind of realized it was a little more serious because it ached for a couple of days and they’ll say well as a rule I know if I have pain in one specific location for more than two or three days at a time and it doesn’t just go away then I have to evaluate and figure out what it is and stop running until I can figure out what it is. Then make a decision about how long to take the pressure off of it so I can keep running. This happens, right? You get injured, you take a couple of days off and you go run and it gets a little worse. But you’re in the middle of your maximum build phase. You know you’ve really got to keep ramping up if you want to do well on your race. What do most runner do? Well they say “Okay well maybe I’ll just try to do this run today but not yet evaluate it.” But they say “Maybe I’ll try to do this run today, maybe I’ll just go and run slow.” After all I am doing a one hundred mile trail race so I am going to be running relatively slow just for a very very long period of time. They sort of justify this “Okay, well since I’m going to run slow on my race day maybe I’ll just go test it and run as if it were race day today and just go run like ten miles on a fairly easy trail and see how I do” and they go out and they run and they’re not really like limp running. They’re not really like trying to keep the pressure off. They’re not really aching with every step and you realize pretty quickly that if you run a certain way at a certain pace with a certain type of gait when you run, you kind of get away with it. So you’re thinking “Okay well maybe I can do this. Maybe I can just keep doing these sort of half runs like not really building my strength runs, not really running in the way it makes me feel confident and fit. But I can keep doing that and then I can show up on race day and then I can just suffer through that hundred miles and make it to the finish line, get my t-shirt, go home and call it a day. Well that’s sort of a reasonable approach but in my mind that’s the wrong approach. So what most runners do is they get to that point and they say “Well you know I have a couple more weeks. So what I’ll do is I will basically kind of do these half runs, half training. Not really full effort. Not really full speed. Not really full string expanded during these runs and I’ll see how it goes and then if it’s not going well then I’ll cancel my race a couple of weeks out and then see if I’m good if I get the refund and stuff or if I feel okay I’ll just push through and see if I can do it” So that’s what a normal approach, that’s the way that we think right? We think well if we can just get through and I think I can get through that, if I can just get through that, then I can get through the race. It doesn’t always work out that way. So I don’t believe in fracture walking boots for every injury. I don’t believe fracture walking boots are the best treatment for almost every runner. I think they’re the wrong thing most of the time for runners. There’s some cases when you really need a fracture walking boot. 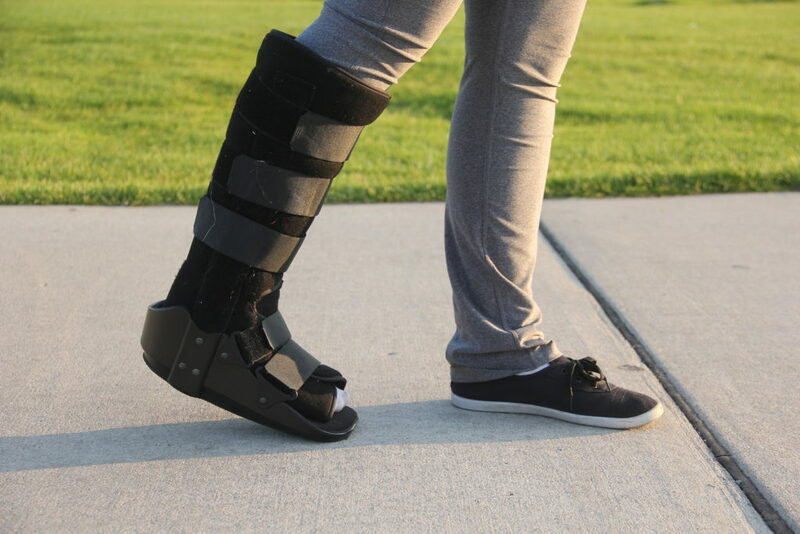 But even though I kind of think of the fracture walking boot as the arch enemy of the common runner, I think that you can use it sometimes a tool to help you make assessments. Just because you get injured doesn’t mean you can’t do your race first of all even if a doctor tells you so. Obviously if you’re in a boot for a month or a month and a half, you take it off the day before the race. You can’t go do a race and do well and not only would you not do well, it’s extremely risky to do a race when you’re that weak and your that stiff after having been in a fracture walking boot. So the thing is like I got this big bruise on the side of my foot. I looked at it. I knew what it was. I knew what the problem was. I knew that it was risky. I knew that most doctors would say “That’s it! Fracture walking boot for four to six weeks.” I don’t want to do that. So what I did was I really aggressively iced it that day. So if you do the contrast bath routine or something, you get the inflammation out, then put on compression socks to really keep compression on that area so it doesn’t swell anymore. I put in a fracture walking boot. I wore the boot for a couple of days. I took the boot off after two days, took the compression sock off, I pushed on that area, no pain. I still have a bruise. That had not gone away yet but it didn’t hurt. I pushed on it, no pain at all and I thought “Okay, great! I’ll go ride my bike and see what happens.” I went out and rode my bike for like an hour or so. No pain. I waited till the next day. No pain at all. I got on my bike, I tried it again. I rode like thirty five miles or something. No pain. Then I went out and I rode like seventy miles. No pain. So then I rode like a hundred miles, no pain at all. I basically cycled. I was doing other things to maintain my fitness. I got to Ironman Florida four weeks after I got this huge bruise on the side my foot. To date my fast Ironman ever. That was my fastest Ironman in my entire life and it was four weeks after I had this injury that would have normally got me in a fracture walking boot for month or a month and a half. That’s the first thing you have to understand is that you have to figure out where you are with the injuries. So a fracture walking boot can really help with that process. So I was talking to this runner yesterday and I said “Look, one option yes that you can do that. You kind of take a couple of days off or you can just kind of half run on it and see if it gets worse. If it doesn’t get worse and you can kind of half run on it then you could still do your race. I assume it’s not really going to be a fast race but you can probably get through it.” That is one approach. A lot of times what happens is that people are sort of half running and their symptoms are very slowly almost imperceptibly creeping upward and they’re kind of getting worse. They just don’t realize they’re actually getting worse and so then it’s passed that time when they could’ve gotten a refund for the flight or the hotel or the rental house and then they realize they’re not going to be able to do the race. That they do have too much pain. They do have too much inability to run and there’s no way they’re really going to make it through one hundred mile race and then they cancel and they’re really bummed out and deflated. So first of all you have to decide how important the race is to you. If it’s Ironman Hawaii and you’ve been trying to get in for ten years. I might tell you do it anyway. If you’re doing a Western States 100 and you have really been training for like ten years trying to get in and you finally qualified and your finally in, I would probably help you try to figure out how to do the race in the safest way possible. So you have to decide how important it is to you. If it’s not very important then yes, the right answer is probably like “Okay just skip the care if you don’t really care about the race. But if it’s a race where you know you cannot possibly get into it with ease in the future or doing equivalent race well then that’s a different story.” You have to be very careful about that. You need to make the right assessment on “Is this going to be something that you can skip and feel good about it” and if you spend your whole life qualifying for the Boston marathon and you’re finally in, you probably don’t want to skip that. You probably want to figure out how to make it through the race. Just to say you did it. But you have to decide that first. Step one, figure out what the real goal is. Figure out how important that race is to you. And if it’s really important then figure out whether or not you can do it safely. So here’s how fracture walking boot works in that respect. The idea is that a fracture walking boot, you put it on, hold you completely still. Holds everything still. You’re not going to move your foot. It has curvature under the sole so that when you walk on it, it actually off-loads your forefoot, decreases all the stress and spreads them evenly across the foot so they don’t have a lot of isolated stress in one particular area where you may have an injury. The fracture walking boot can really protect you. After all it’s called a fracture walking boot. It is design for people who have fractures to allow them to walk. One of the keys with a tendon injury is keeping it completely still to get it to heal. No matter what tendon it is in your foot, there is no way you can hold any tendon in your foot completely still while you’re walking unless it’s locked up in a fracture walking boot. If you have a fracture walking boot or you order one online, you get a fracture walking boot and you put it on just for two days. Two days is not going to kill. You’re not going to lose a lot of fitness in two days. It’s not really big deal if you missed one or two workouts. So basically if you’re like a month out from a race and you put on a fracture walking boot that evening, you iced the foot like crazy, put on a compression sock, put on the fracture boot and then keep the boot on twenty four hours a day. Treat it like a cast, do not take it off at all over the next forty eight hours. Then you get to make an assessment of how this is going to help you. If you go like all the way through the next day, all the way through the following day. You’ve really used it, not taking it off. You wear it in the shower, you cover it with a plastic bag. You really let the things heal and immobilize it just to let it heal and calm down, it can help you make an assessment not only on your condition but how likely it is you could actually finish that race. So use the boot, you keep it on and then after two days you get the boot off. This is not complicated. You take the boot off and then what do is you just push on that structure with your thumb. Push on that structure and see how it feels. If you don’t have any pain at all, this is a very good sign just like mine. I took off the boot after couple of days, no pain when I pushed my peroneal tendons. Then I went for a bike ride. So then you something else like that. Something simple. Get on a stationary bike, go for a bike ride. We go do something that’s low impact and just see if the thing will work without hurting. If you don’t have any pain later that day, you don’t have any pain the next day, well then go for short run. Just go out and do a very easy run on very predictable surfaces. Hopefully with you running on the right side of the roads that the slope of the road is in the correct position for your particular injury. I got another episode that talks about all that but you have to basically make sure that you’re running safe as possible for you. Maybe could go run on the track. You run on some places that are very forgiving that you think of as your easiest place to run. Do that and see how it feels. If you’re not having any pain during the run, this is a really good sign. If you don’t have any pain later that day, that’s a good sign number two. If the next morning you wake up and you have no pain at all, you’re on the right track. This is good news all around. At that point then you could go for a longer run. You could make it longer. You don’t necessarily want to do a lot of intensity or doing any risky. You don’t want to go run on an uneven trail. But if you do a long run on a relatively forgiving surface, you see how it goes. If it goes well, you know you’re back on track. Again, you have to be cautious. You have to realize you have a recovering injury at this point so this not complicated. If you basically rapidly ramp up to your normal intensity or if you just go and take those workouts that you skipped then you jump to the next highest workout after that, that’s really high intensity, really long, really hard work, really stressful. Then it is really risky, you shouldn’t do that. Instead you should talk to your coach. Talk to your doctor. Figure out what is best here. Is it better for me to just do some long runs to maintain all of my fitness or is it better to do some short runs to build intensity. If you’re coach is ambivalent and your coach says it doesn’t really matter, you could do some long runs, just maintain your fitness, you’ve already been exercising for months, you have been working for a long time. You’ve already got all that in the bank. You’re really good shape the race right now. 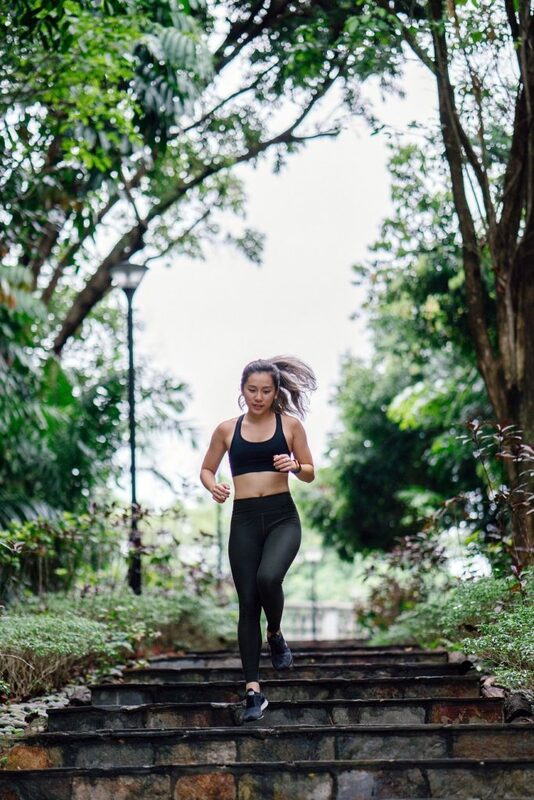 All you need to do is not get more injured and you need maintain your fitness then you’re probably better off just doing some like easy long runs and just maintain your running form, your running fitness and your aerobic fitness so that you’re ready to go on race day. That’s the thing is you can use your fracture walking boot not as a long-term treatment but a short-term treatment to help you decide how severe the injury is and whether or not you can then continue to run and make it to race day in one piece. Now the flipside of that, let’s say you use the boot for a couple days, you take it off and as soon as you take it off you push on that injury. That basically suggests more severe injuries. So if you sit for a couple of days and it makes no significant change in just a couple of days, at that point you can confidently call the race because you can say it’s been two days, I completely immobilized the thing, completely stayed off of it. I slept in the boot. I showered in the boot. I didn’t take it off and then what I did take it off, iIt hurt. Well now you know for sure. You know you have a more severe injury. You know it’s going to be a more significant treatment to actually get it to heal and if you just try to keep doing these sort of half runs where you’re not really training hard, you’re not really doing your full effort but you’re still not allowing it to heal, there’s no way you’re going to make it through the race in one piece. At that point then you can confidently say “Okay, doing the race is the wrong thing here.” And then just because you have done a couple of days in a boot, you have an answer. You have a concrete answer and that concrete answer I think most of the time is a better answer than you’re going to get from an X-ray or an MRI or anything like that. You really have to think about that, you have to be sensible. So if you can really just sort of lock it up and aggressively treated it, really remove the inflammation with contrast baths, really prevent the inflammation from coming back by using compression socks, you’re elevating your feet up the wall, something like that and then also use the fracture walking boot to really thoroughly mobilize it for just a couple of days to see if all the symptoms will sort of vanish right away then you know it’s a minor injury and you know that you can work closely with your coach to develop a plan to maintain your fitness, show up at the starting line and then make it to the finish line.